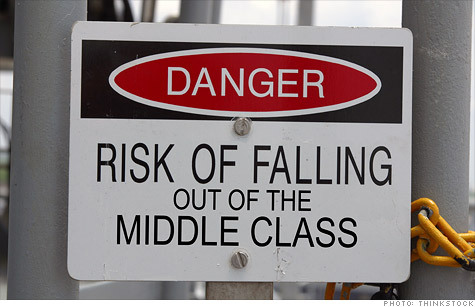 Nearly one-third of middle class suffer downward mobility. NEW YORK (CNNMoney) -- Nearly one third of Americans who were raised in the middle class dropped down the economic ladder as adults -- and that's before the Great Recession hit. Things have only gotten worse in recent years. The Great Recession has likely made it harder for many people to remain in the middle class, experts said. Long-term unemployment has devastated the ranks of the middle class, with many people losing their homes and forced to turn to food banks and government aid after they run through their savings. It takes nearly 41 weeks, on average, for the jobless to find new work. Also, the steep decline in home values has hurt many in the middle class. Recovering from a huge drop in income is not easy, a separate Pew study found. Half of people who lost more than 25% of their income in 1994 had not recovered four years later. And a third did not regain their economic footing after 10 years. While it remains to be seen how quickly Americans will recover from the current economic downturn, Currier suspects it could take even longer. Young adults may find it particularly difficult to hold onto their parents' middle class status. That's because they are having a much harder time landing jobs, particularly well-paying positions in their field. The unemployment rate for 20- to 24-year-olds was 14.4% in December, compared to the national 8.5% rate. This could hurt their earning potential for decades to come, which has earned them the nickname "The Lost Generation." "Entering your career in a down economy has lifelong ramifications," said Scott Winship, economic studies fellow at Brookings Institution.